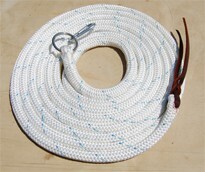 Constructed from high quality 9/16" double braided polyester yacht line. This hand made piece is equipped with Ring and Carabiener at one end and a premium latigo popper at the other in a choice of 20 colors. This Longe Line is identical to those sold on the top trainers’ web sites but at a much more reasonable price.